In 1795, now fifteen years-old, he sensed a call into the ministry—though as yet still quite immature in his faith—and so he was enrolled as a student of Divinity. That session, he actually studied very little theology because having recently taught himself sufficient French to use the language for study, he pursued his researches into theoretical mathematics with renewed vigor. Nevertheless, towards the end of the session he was deeply stirred by the power of the writings of Jonathan Edwards and came to an intellectual grasp of the magnificence of the Godhead and of the providential subordination of all things to His one sovereign purpose. During these years another part of his great talent began to come into prominence. On entry to the University his expressive proficiency in English grammar and rhetoric was at best immature, but after two years of study, there was a perceptible change. The gifts of powerful, intense and sustained expression revealed themselves with freedom, spontaneity and beauty. Student Debating Societies, class discourses, and daily prayers in the University were all enriched by his tasteful, capable and eloquent participation. In July 1799, he was licensed to preach after a special dispensation exempted him from the qualifying condition of having reached the age of twenty-one. At the same time, he became a teaching assistant at the University of Edinburgh in the widely varied disciplines of Mathematics, Chemistry, Natural and Moral Philosophy and Political Economy. During the winter of 1801, he was offered a post as Assistant in the Mathematics Department at St Andrews as well as the pastorate of the small parish church in Kilmany. And thus began his remarkable dual career as an ecclesiastic and an academic. Over the next forty-four years Thomas Chalmers gave himself to public service. Twenty of these years were spent in three parishes: first at Kilmany and then later at, the Tron Church and St John’s Church, both in Glasgow. The remaining twenty-four years were spent as a professor in three different chairs, Moral Philosophy in St Andrews, Professor of Divinity in Edinburgh, and Principal and Professor of Divinity in the Free Church Theological Institution, Edinburgh, later known as New College. Often, he served both church and university simultaneously, evoking the wonder of the entire world. As a teacher, he aroused the enthusiasm of his students. One of them later commented, “Under his extraordinary management, the study of Mathematics was felt to be hardly less a play of the fancy than a labor of the intellect—the lessons of the day being continually interspersed with applications and illustrations of the most lively nature, so that he secured in a singular manner the confidence and attachment of his pupils.” Likewise, his parishioners found his sermons to be both erudite and winsome, aimed at both orthodoxy and orthopraxy. His reputation was soon spread throughout Scotland. The years of work given to parish ministry were extremely significant in the life of Thomas Chalmers. The mental capacity that he had shown in academic pursuits and his youthful strength of spirit were now brought to the test of service to rural and urban communities at a time of extremely significant social change, and the ever transforming power of the Gospel was to prove itself in and through his life and service. Family bereavements brought Chalmers to reflect more seriously about a dimension of life which, on his own confession, he had not fully considered. His brother, George, three years older, and his sister, Barbara, some five years older, both died within the space of two years. George had been the captain of a merchant ship, but succumbed to tuberculosis and returned home at the age of twenty-nine to die. He awaited the end calmly, his trust resting firmly in Christ. Each evening he had read to him one of John Newton’s sermons and obviously derived especial comfort therein. His quiet and assured faith challenged his younger brother. Barbara, likewise, suffering the same disease, showed great fortitude and confidence in the face of death. The nature of these circumstances brought him to question his previous conceptions. Chalmers now had his priorities set in order before him. He gladly recognized God’s claim to rule the affections of his heart and command his life’s obedience. The remainder of his ministry in Kilmany was profoundly affected by the experience of a vital Christian walk. His preaching had new life and concern, proclaiming what he had formerly disclaimed. His pastoral visitation and his instruction in the homes of his parish showed greater ardor than ever before. From outside the region many came to hear the Word, and heard it gladly. There were innumerable converts to this living Christianity. Chalmers became an earnest student of the Scriptures and also set aside one day each month when, before God, he reviewed his service to Him and sought, with confession and thanksgiving, the blessing of God on his work and on the people entrusted to his pastoral care. These years were also those of the Napoleonic Wars and Chalmers joined the volunteers, holding commissions as a chaplain and lieutenant, though he was never deployed on the continent. He completely abandoned himself to the covenantal community there at Kilmany. He married and had his first children there. He established a classical school at the heart of the parish. He set about a reform of the ministry to the poor, the widows, and the orphans. He established a pioneer missionary society and a Bible society. In addition, Chalmers began his prodigious and prolific publishing career. Thomas Chalmers went to Glasgow at the invitation of the Magistrates and Town Council of Glasgow. He served first in the Tron Church until 1819, and then, by the election of the Town Council, he was transferred to the newly-created parish of St John’s, a poorer parish with a very high proportion of factory a workers, a parish in which he had the freedom to develop the ideas which he had long been maturing. In the later years at Kilmany, Chalmers had made conscience of his work as a parish minister and had come to know the problems of working a rural parish. Now with his newly expanded duties in Glasgow, he came to grips with the difficulties of work in a city parish and applied his intelligence and strength to new problems. From the beginning of his ministry in the city his preaching was fully appreciated, and many attended from throughout Glasgow, but Chalmers was concerned that his ministry should first and foremost be to the parish—where some eleven or twelve-thousand people lived and worked. He commenced a program of visitation from house to house which took two years to complete. He organized the eldership to co-operate in this task and developed Sabbath evening schools. Commencing with thirteen children, the schools grew until within two years they had twelve hundred children under instruction. His awareness of the situation of the people gave him an acute understanding of the problems of illiteracy and poverty in the parish and he could not rest until he had found some means of remedying these. His interest in the working-man furthered his reflections on the economic situation; his interest in the sciences led to the Astronomical Discourses, a series of Thursday afternoon sermons delivered once every two months during 1816. Many businessmen and others left their place of work to hear these and during 1817 nine editions of some 20,000 copies were published. In 1816, the University of Glasgow unanimously conferred on him the degree of Doctor of Divinity. The Lord High Commissioner at the General Assembly in the same year invited him to preach in Edinburgh at the time of the Assembly. Hard work and new-found fame were joined in the experience of Chalmers, but he was dissatisfied. He was convinced that the Christian church had as yet unfulfilled responsibilities to all those who lived and worked in the local parish, not merely to those who attended the local place of worship. In the development of Sabbath School work Chalmers discovered that many children had great difficulty in reading. He resolved to remedy the defect by setting up classical schools throughout the parish—especially for the poor and neglected. Provision for the needs of the poor was also made, not from the poor-rate levy, but from funds administered by the church of the parish through its deacons who were given special training for this work. Relatives of the needy were encouraged to assume responsibility and the government’s poor relief costs for the parish were reduced by more than eighty per cent within three years. And as if all this were not enough, by correspondence he maintained a ministry with many others beyond the bounds of Glasgow, writing on average some fifty letters a week—and they were for the most part, letters of great substance. The years of his ministry in Glasgow were very significant. There was no class of persons untouched by his labors. Before his time many had fallen away from all Christian belief and observance, but under his ministry public sentiment turned decisively to evangelical liveliness. By his labors living faith in Christ was restored and many men and women throughout the city gave themselves for Christian service. When he was invited to return to his former University, St Andrews, as Professor of Moral Philosophy, he accepted because he saw it as a position of wider usefulness and also because he felt that the pressure of life in Glasgow which had progressively increased was making excessive demands on him. But his concerns for the urban parishes remained undiminished. His interest for instance, in dealing with the problem of poverty led to an invitation to London by the Parliamentary Committee on the Irish Poor Law. In 1840 he gave a paper at the British Association for the Advancement of Science recommending the system of voluntary assistance to the poor. He was well informed on the major public issues of his day—Roman Catholic Emancipation, the Reform Bill and the Corn Laws and his opinion was valued by great and small alike on all of these problems. In 1832 the Bishop of London recommended the President of the Royal Society to invite Dr Chalmers to prepare a treatise in proof of the wisdom and benevolence of God shown in the works of creation. It was published in the following year with funds from the legacy of the Earl of Bridgewater and was known as the Bridgewater Treatise. Amongst the honors that had come his way in the same year was his election as Moderator of the General Assembly of the Church of Scotland. He had previously formed part of a delegation on William IV's accession in 1830 and had been named as one of His Majesty’s Chaplains in Scotland. He was later to present a loyal address on behalf of the University of Edinburgh to Queen Victoria on her accession in 1837. In January 1834, Dr Chalmers was elected a Fellow of the Royal Society of Edinburgh and the following year became one of its Vice-Presidents. The Royal Institute of France honored him with the title of corresponding member and four years later, in 1838, he visited France and read a lecture on the “Distinction both in principle and effect between a legal charity for the relief of indigence and a legal charity for the relief of disease.” His many books and sermons were invariably best-sellers for years on end. Thus, his reputation was well-established, his contribution to the life of Scotland, England and Ireland fully recognized, and his fame spread around the world when he found himself not only involved in, but leading, a movement that was to divide the Church of Scotland, and to set him in apparent disregard of the authority of the highest civil court in the land. With the disappearance of the Roman Catholic Church in Scotland as a spiritual force in the sixteenth century, the Presbyterian Church had assumed the right to be the Church of Scotland. Its struggle for spiritual independence had been a long and costly one under the leadership of John Knox, Andrew Melville and Alexander Henderson amongst others. At long last, in 1690, the Presbyterian Church was legally recognized by the crown as the established Church of Scotland, but in this recognition by the state there was no question of the church surrendering any aspect of its independence. It was free to follow the guidance of the Divine Head in every aspect in which He had expressed His will. Patronage, or the right of landowners to bring to a parish a minister who might or might not be acceptable to the elders and members of it, had been brought in by Act of Parliament in 1712. But in 1838, in two cases in particular, those of Auchterarder and Marnoch, ministers were forced on congregations opposed to their settlement and the Court of Session and the House of Lords ratified these decisions. Many in the church were seriously perturbed. There were other areas of concern as well. It was decided that the Church did not have the power to organize new parishes nor give the ministers there the status of clergy of the Church. She had no authority to receive again clergy who had left it. And perhaps worst of all a creeping liberal formalism was slowly smothering the evangelical zeal of the whole land. Alas, despite repeated requests, the Government refused to take action to deal with the threat of spiritual atrophy. After a ten year long struggle to regain the soul of the church, the evangelical wing, led by Chalmers and others laid a protest on the table of the Assembly some four hundred ministers and a like number of elders left the established Church of Scotland on May 18, 1843, to form the Free Church. 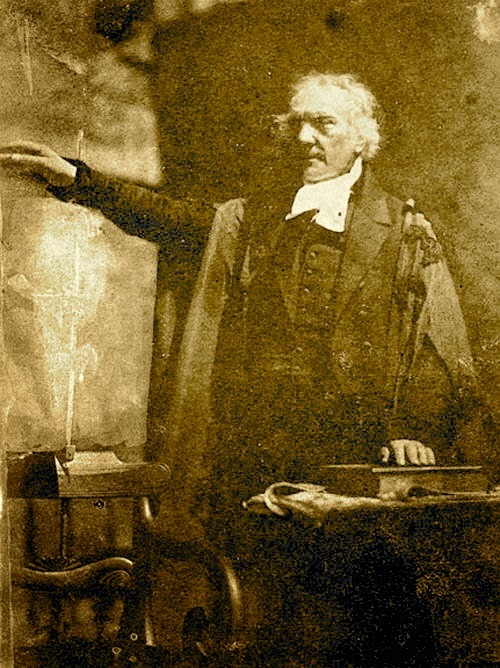 When the General Assembly of the Free Church was constituted that grave morning, Thomas Chalmers was called to be its Moderator. He was the man whose reputation in the Christian world was the highest; he was also the man whose influence in directing the events leading to what would eventually be called the Disruption had been greatest. The ministers who left the Established Church with Chalmers that day sacrificed much. In the personal sphere their houses and financial security were set aside, their work had to be reorganized and new centers for preaching found. Chalmers, in this respect, also suffered loss. He was no longer Professor of Divinity at the University of Edinburgh and the influence and prestige of that position went to another. But the Church realized that, without continued pastoral training, its future was bleak. A center for theological study, the Free Church Theological Institute, was opened and Chalmers was appointed Principal and Professor of Divinity. A few years before, when Chalmers had completed his sixtieth year, he looked forward to a “sabbatical decennium,” a seventh decade of life that would be spent as “the Sabbath of our earthly pilgrimage—as if on the shore of the eternal world.” The years before 1843 had brought him little of the rest and peace that he hoped for and, of course, after the Disruption, he had even more to do. The means for supporting the ministers of the church following the Disruption had to be found and Chalmers dedicated much of his time and energy to the setting up of a Sustentation Fund. By the end of 1844 it was clear that the cost of maintaining spiritual independence would involve foregoing any financial assistance given by the State. It was under his leadership that this problem was confronted and resolved. In addition, new sites for some 700 churches and manses had to be found for the congregations that were formed, and there were difficulties with several landowners in getting sites. In many cases Chalmers was able to give assistance through his personal influence. His own home in Morningside was used as a place of worship for years afterward. All this effort was not dedicated simply to perpetuating an idea, for Chalmers had a vision of Scotland in which all her people from those of highest to those of lowest rank would know and love the Lord Jesus Christ. Perhaps the dearest example of the outworking of this vision is seen in the West Port experiment in Edinburgh, “a fourth part of the whole population being pauper and another fourth street beggars, thieves and prostitutes.” The population amounted to upwards of 400 families of whom 300 had no connection with the Church. Of 411 children of school age, 290 were growing up without any education. The plan of Chalmers was to divide the whole territory into twenty districts each containing about twenty families. To each district a discipler was appointed whose duty was to visit each family once a week. A school was provided. By the end of 1845, 250 scholars had attended the school. A library, a savings bank, a wash-house and an industrial school had been provided, and there was a congregation served by a missionary-minister. Chalmers often attended the services there and would take part as a worshipper alongside the people of the district. At the end of the College Session in 1847 Chalmers, by now exhausted in his ceaseless labors, went to London on the business of the Church. He returned to his home in Morningside to prepare for the General Assembly on the following Monday. It was after family worship on Sunday evening May 30 that he said goodnight. He went to sleep in Morningside, but he awoke in Heaven. Dr. Grant I wondered as I read your book Micah Mandate how you feel about your views on the church given nearly 20 years has gone by? BTW this book is amazing and though I read it 15 years ago I think my heart is now seeing what my eyes missed before. Bless you Brother for this work of insight. May we act justly, love mercy and walk humbly with our God! Thank you, Brian. I trust that over the years since I wrote that book I have grown in grace and wisdom. Even so, I still consider "The Micah Mandate" as my credo, my mission statement, my vision agenda. To know and be known within the context of Parish Life is foremost in understanding its beauty. I would not say a small congregation is better, but I would say a right sized one is always. I went to a funeral of a fellow co-worker who was a believer. Leaving the service I was met by another friend and believing co-worker who seeing me asked me a question, a question that had already sadly burdened my thoughts. He asked, "What was missing? ", to which I responded, "His pastor did not know him". Now this was his pastor, but he did not really know him, and that broke my heart. When I die, I want my pastor to intimately know myself and my family, because we have developed a relationship of joys and tears together. To me, that is the beauty of Parish life. PS... Finally found my copy of Micah Mandate, which had been lost during our last move. Priceless find. Dr. Grant's work on Chalmers is a model of pastoral theology and praxis shaped by a life well lived and a ministry well spent. I am using this page as a required reading in a Doctor of Ministry class coming up so that our students may cultivate a spiritually-healthy, vocationally-satisfying, and parish-focused appreciation for church history informing pastoral life. The Rev. Dr. George Grant exemplifies the life of a pastor-scholar. Thank you, Mike. I am both humbled and honored by your kindness. I have learned so, so much from you, in your classroom, in your parish labors, and in your home.